Rambuck was in southern Illinois today on a scouting trip and called with a report that the white oaks are starting to drop. He was able to locate a couple dominant trees, but said that he wasted a lot of time checking unproductive areas. It wasn't until he recalled an observation that we have made many times that he began to find acorns on the ground. 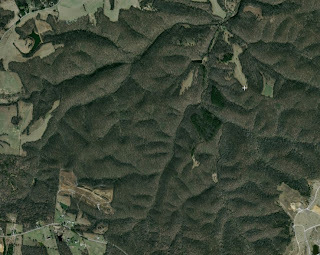 If you are having trouble locating acorn-producing trees (assuming you know how to identify them - if you don't, click on the Tree ID articles to the right) try concentrating your search on the north-facing slopes of hills. The ground will contain more moisture because it is not exposed to the harsh sun like the south-facing and west-facing slopes. East-facing slopes are somewhere between north-facing and west-facing slopes in moisture content. Take a look at where the shadows fall in this aerial photograph. More moisture often equates to more nuts. This is obviously not a hard and fast rule, but it seems to hold true more often than not. If I'm scouting an unfamiliar area, I always start with the north slopes, especially if the ground vegetation seems dry and burned up on the southern slopes. See the Size Matters article for a discussion of other factors that influence mast production. Hope that helps. Leave us a comment and let us know. Thanks Steve. We hope you find some useful information here. Happy hunting. great info but the aerial photo is misleading because none of the north facing slopes have a shadow on them. Anonymous, are you standing on your head? :-) Just kidding. When I looked at the photo a few minutes ago, it had somehow gotten flipped 180 degrees so North was facing down. Now it is correct again. Very strange! Thanks for making me aware. bpitas - It looks OK to me now. The shaded sides of the ridges are on the north-facing slopes. Don't know why it would just suddenly flip. Maybe has something to do with Haloween!